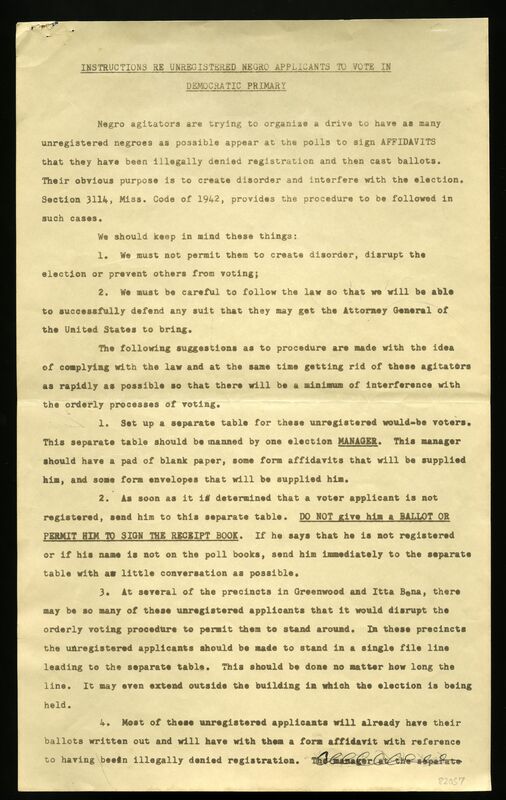 The Gilder Lehrman Institute recently acquired a collection of civil rights documents, including the two discussed here. In the summer of 1963, the Student Nonviolent Coordinating Committee organized “Freedom Vote,” a campaign to challenge obstructions faced by African Americans attempting to vote in Mississippi. Using a Reconstruction-era law that allowed voters to cast provisional ballots if they had been prevented from registering, the Freedom Vote encouraged unregistered black citizens to cast provisional ballots in the Democratic primary. In response, officials circulated this document to Democratic polling places. It gives guidance on how to minimize disruptions by moving unregistered voters to a separate table and to follow a specific affidavit process, no matter how long the line. The election officials were also told to avoid conversations with those submitting provisional ballots and offer them no assistance. More than 80,000 black Mississippians submitted provisional ballots in the primary, but ultimately none were counted. 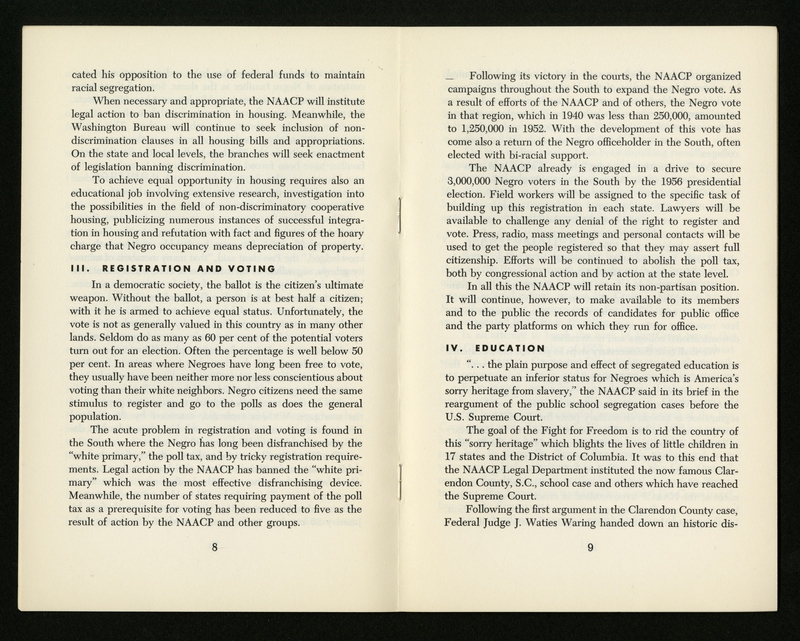 Eight years earlier, in 1955, the NAACP had published a pamphlet entitled Target for 1963, establishing goals for civil rights advancement. The pamphlet highlights the “Fight for Freedom Campaign,” which addressed employment, housing, education, transportation, and hospitals and other public spaces as well as voter registration. 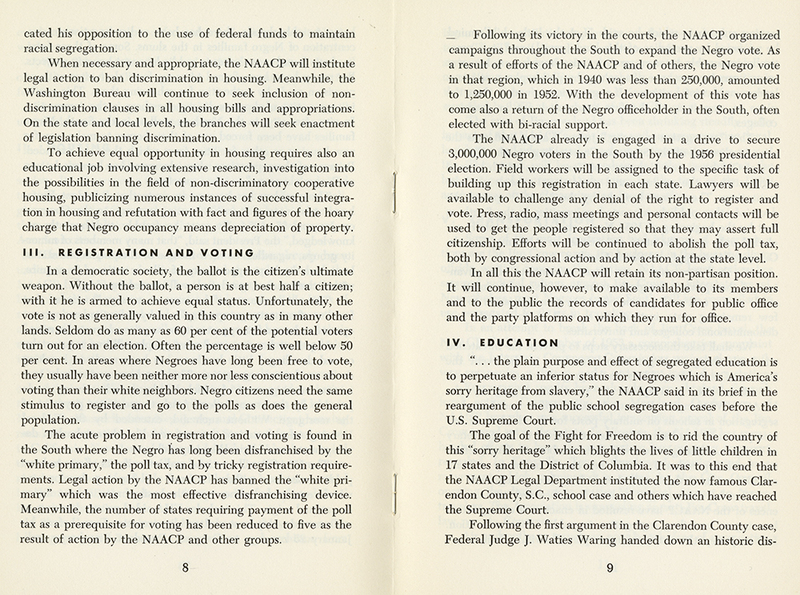 The page shown here highlights the legal advances that had been made by 1955 in voting rights, including ending white-only primaries and poll taxes, and the work to increase the number of black voters.